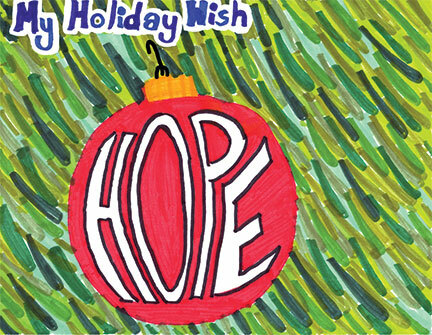 Pittsburgh, PA, November 29, 2012 – When asked to describe her holiday wish, Wexford student Réka Götz, age 9, summed it up in one word—hope. And this season, she will have the opportunity to share her wish with many others on a holiday card. Réka is the Grand Prize Winner of the 9th Annual Edgar Snyder & Associates "My Holiday Wish" Coloring Contest. As a winner of the contest, her holiday artwork appears on the front of the law firm's holiday card. In addition, Edgar Snyder & Associates has donated $1,000 to Marshall Elementary School in her honor, and awarded her with at $250 gift card. 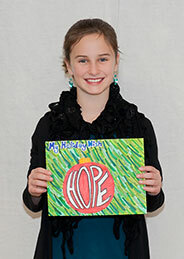 Réka's design features the word "HOPE" written on a vibrant red holiday ornament with a green background. "For some people, the holidays are a sad time because they miss people they love," said Réka. "It gives them something good to think about. Also, not everyone has the same religious customs, so ‘hope' is something all people can relate to." Eileen Townsend, Réka's art teacher at Marshall Elementary, has watched her progress from first to fourth grade in her art. "She is very conscientious in everything she does. She is enthusiastic and a hard worker who aims high no matter what activity or subject." On November 1st, a panel of judges from across western Pennsylvania selected the winning artists. Judges included: Ashley Andrykovitch of the Carnegie Museum of Art; Tamara Pavlock of the Art Institute of Pittsburgh; and Myrna Rosen of CMU and the Pittsburgh Center for the Arts; as well as Kristi Schaefer and Scott Wallace, both of swz design. The law firm received more than 700 entries to the contest this year. "The students showed talent and creativity, but what is most impressive is that these young artists have such mature and unselfish holiday wishes," said Attorney Edgar Snyder, who has helped children seriously injured in accidents for the past 40 years. "You'd expect requests for game consoles, toys and puppies, yet we received wishes like peace, hope, food, and happiness." Réka, her mother, and her art teacher were invited to the Edgar Snyder & Associates offices to accept the $1,000 donation on behalf of Marshall Elementary School. Edgar congratulated Réka and snapped a photo together with her doing the famous "point" that will be featured on a holiday edition billboard. Réka's outside activities include figure skating, soccer, piano and cello. She is also a Junior Girl Scout. "Her mind never stops generating creative ideas," remarked Réka's mother Amy Götz, citing her recent "Boredom Cures" project during Hurricane Sandy that included activities like tile skates, pillow piles, supernatural makeovers, and survival of the lava floor. Réka has also designed an extensive inventory of mustache illustrations and recently made earrings out of bottle caps for a recycling project. What does Réka plan to do with her $250 gift card? "Buy an iPod Touch 5th Generation!" In addition to Réka, four other students were recognized for their holiday submissions: Bryson Huwar, 8, of Clarion-Limestone Elementary in Clarion; Maggie Knisely, 10, of Claysburg-Kimmel Elementary School in Claysburg; Emma Kraus, 10, of Paynter Elementary in Baldwin-Whitehall; and Carter Mates, 6, of Rumbaugh Elementary School in Mt. Pleasant. The runners-up each received a $100 gift card and will have their artwork included on the back of the holiday card. To view all of the students' winning artwork, visit www.edgarsnyder.com/coloringcontest or www.facebook.com/EdgarSnyderAssociates. Edgar Snyder & Associates is a law firm representing injury victims and people with disabilities, with offices in Altoona, Ebensburg, Erie, Johnstown, and Pittsburgh.